We grow a variety of veggies, fruit, herbs, and flowers. You will get the best variety of our products by signing up for a flower or vegetable CSA! (we accept snap and EBT) To find out what items we are bringing to markets this week click market list. We grow a wide variety of vegetables, blackberries, blueberries, and strawberries. 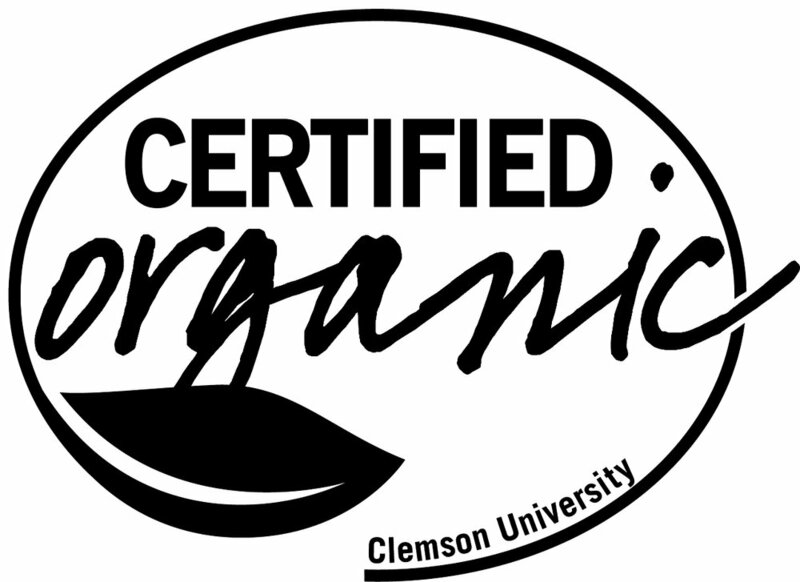 All our vegetables and fruit are USDA certified organic by Clemson University. We grow both common and a few not so common ones. We grow standard basil, lemon basil, holy basil, Thai basil, oregano, mint, rosemary, shiso, roselle, sage to name some. Genovese basil is available in the summer in large portions for pesto. We grow a variety of organic flowers, herbs, and foliage and have many options to provide the freshest and most unique florals for everyday enjoyment, as well as your most cherished events. Our seasonal flowers are available at several local farmers markets and we also offer weekly CSA Flower Subscriptions, DIY Buckets, and “A La Carte” options as well. Two years ago, we began to dabble in indigo. The first year, planting a handful of the tiny seeds, we were able to grow only a few plants but did harvest lots of seeds-enough to grow a much larger crop the second year. That second year’s harvest allowed us to produce a few vats of indigo dye. We are excited about this adventure of growing, processing, and dyeing with our indigo. We look forward to sharing this historical crop and the magic of indigo dyeing in workshops to be held in late summer and fall 2019. We offer many options to provide you with the freshest blooms for everyday enjoyment as well as your most cherished events. Our lush bouquets and arrangements are one-of-a-kind combinations of our cultivated flowers, foliage, and aromatic herbs, often including wildflowers, foraged vines and grasses sustainably harvested on our certified organic Lowcountry farm. DIY Buckets: Do-it-yourselfers can arrange to pick up DIY buckets of our seasonal organic blooms and foliage. A la Carte Flowers: We offer “A la Carte” services for weddings and events in which you can order custom bouquets, table arrangements, corsages, and boutonnieres. Reflecting the beauty of the Lowcountry, we use our own cultivated flowers, herbs, and foliage, as well as vines and grasses sustainably foraged on our organic farm. This is a great option for smaller events or to use in combination with DIY Buckets. If you are interested in our flower services, please fill out the form below! Please provide a brief description of your event. Photos are welcome. (For weddings, please include number in wedding party). Please include other additional information we should know. We are Certified to Forage Mushrooms too!